'Batman' Actor Adam West Dies At 88 : The Two-Way The actor donned Batman's costume for TV in the '60s, giving an enduring rendition of the hero. Later in his career, West enjoyed a renaissance as a voice actor. His family says he died Friday night. 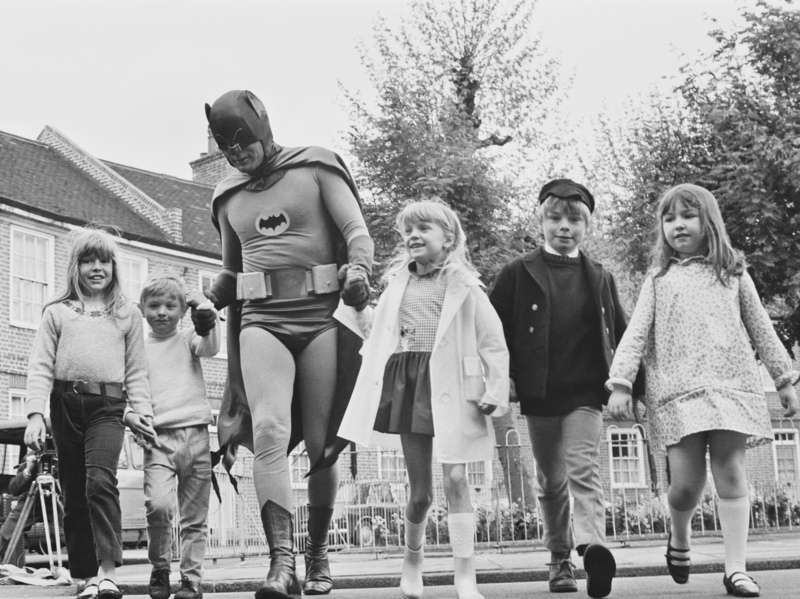 Adam West brings out his alter ego, Batman, for the filming of a 1967 road safety ad for children. Adam West, the actor behind one of the most beloved and enduring renditions of Batman, died Friday night at age 88. West donned the black mask of the Caped Crusader in the 1960s, playing the role as a plucky, intrepid hero for television. "Adam West passed away peacefully last night after a short but brave battle with leukemia," his family writes in a Facebook post. "He was a beloved father, husband, grandfather, and great-grandfather. There are no words to describe how much we'll miss him." It's fair to say Batman has worn a number of masks since the character launched nearly eight decades ago; it's also fair to say that few — if any — have proved as lasting as West's portrayal. The TV series West led, which ran from 1966 to 1968, filled the small screen with "pop-art sensibility, vibrant colors and rogue's gallery of playful guest stars," Fresh Air critic David Bianculli said in 2014. Despite this revolving door of big personalities, it was West's bright spin on the Dark Knight that came to be synonymous with the series. The show — and its 1966 film adaptation — managed a distinctive "tonal jiu jitsu: high silliness executed with grave seriousness," NPR's Glen Weldon wrote last year. See Exhibit A: "Some days you just can't get rid of a bomb!" Of course, West eventually dropped the cape of that intrepid hero, starring in dozens of films and eventually reinventing himself as a voice actor — perhaps known best for his recurring role as the mayor (also named Adam West) on Family Guy. But he never quite got out of Batman's long shadow, both for better and for worse. West shared a complicated relationship with his signature character. "There was a time when Batman really kept me from getting some pretty good roles, and I was asked to do what I figured were important features. However, Batman was there, and very few people would take a chance on me walking on to the screen," West once told Variety. "So I decided that since so many people love Batman, I might as well love it too. Why not? So I began to re-engage myself with Batman. And I saw the comedy. I saw the love people had for it, and I just embraced it."